Hilarity – This Square Peg. Blogtober #20: We’ve Got a Lituation. October 20, 2018 Categories Autumn, Hilarity, WritingLeave a Comment on Blogtober #20: We’ve Got a Lituation. As seen on the Twitter, tweeted by Reese Witherspoon, retweeted by Ava Duvernay, and infinitely loved by me and all fall lovers out there. Happy Saturday, y’all. Get lit. January 27, 2017 Categories Beauty, Hair, Hilarity, Me, Woman5 Comments on “edge control”? 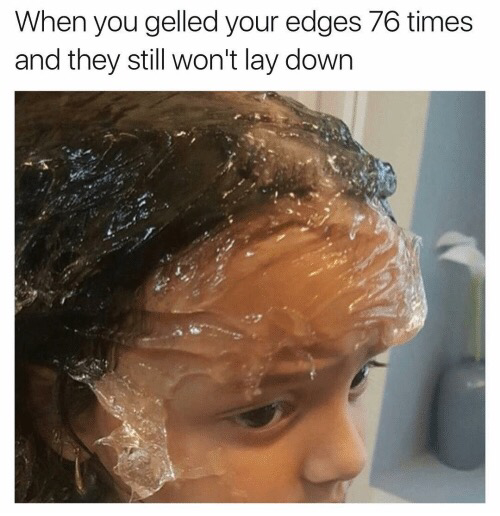 Who are the scientists or hairologists that create the gel for those of us with edges that have temperamental minds of their own? They need to work harder. Because people like me with edges like me laugh at these gels, these silly things that do absolutely nothing to tame these rebellious follicles that rest on the borders of my hairline. Normally, I wouldn’t care. I’m the kind of naturalista that puffs my hair and doesn’t take the time to smooth things out at the front. Smooth isn’t that important to me. But then I started taking Biotin and vitamins to make my hair stronger and yay, my hair started really growing and getting fuller, but whoa, my hair started really growing and getting fuller and goodness, I looked like I lived in someone’s backyard. And with braids (I’ve had braids since December; done and re-done), if one wants a ponytail or to pull the braids back, the edges cannot shame you. But mine shame me. Every. Single. Day. So I purchased this “edge control” gel, which a woman at the shop claimed would do wonders for my edges. Nope. Nope. Nope. The hair lays for approximately 5 seconds and then rolls its eyes at me and sticks right back up. Wild and curly and crazy. Unabashedly untamed and unkempt. But you know what? I’m c’est la vie-ing it, folks. That’s life. Bushy edges and all. I can’t change them. There is no control. But am I the only one? If you have rebellious edges, kindly let me know in the comments. Edge misery (not really though) loves company. Happy Friyay, bon weekend, and onwards and upwards. November 19, 2016 Categories Hilarity, Life, MeLeave a Comment on Blogvember #19: The Wrestler. October 31, 2016 Categories Bold Names, Hilarity, PeopleLeave a Comment on The Chocolate Meeting. Scene: after a premiere that I’ve somehow been invited to, during a meet-and-greet. Lupita: Hello, [Government Name]. It’s a pleasure to meet you. Thank you so much for your support. Me: Your elegance, talent, and grace are inspiriring, Ms. Nyong’o. 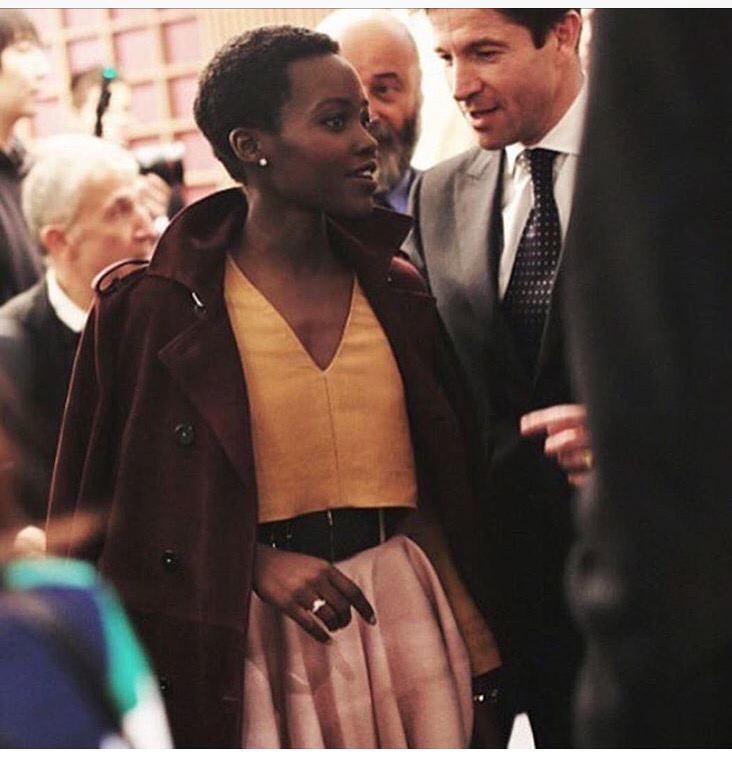 Lupita: Oh, please call me Lupita. And thank you so much! Lupita: Hello, [Government Name]. It’s a pleasure to meet you. Thank you so much for your supp–oh, dear. Someone call a paramedic. The poor woman has fainted. i ate a burrito and my stomach turned into an extraterrestrial. October 13, 2016 October 13, 2016 Categories Hilarity, Life, Me6 Comments on i ate a burrito and my stomach turned into an extraterrestrial. This is a story about peer pressure. Plain and simple. I stared at him and that burrito until the stoplight turned green. Some minutes later, I reached for my trusty smartphone GPS, searched for a Taco Bell (there was no time to locate authentic Mexican fare, reader, not when my belly was officially running things), found it, drove there, and ordered my version of what I saw Burrito Man eating. It was delicious. Or was it? I don’t know. I ate it so quickly that I tasted nothing but air, really. My hunger and burrito longing had been satiated. All was right in the world. 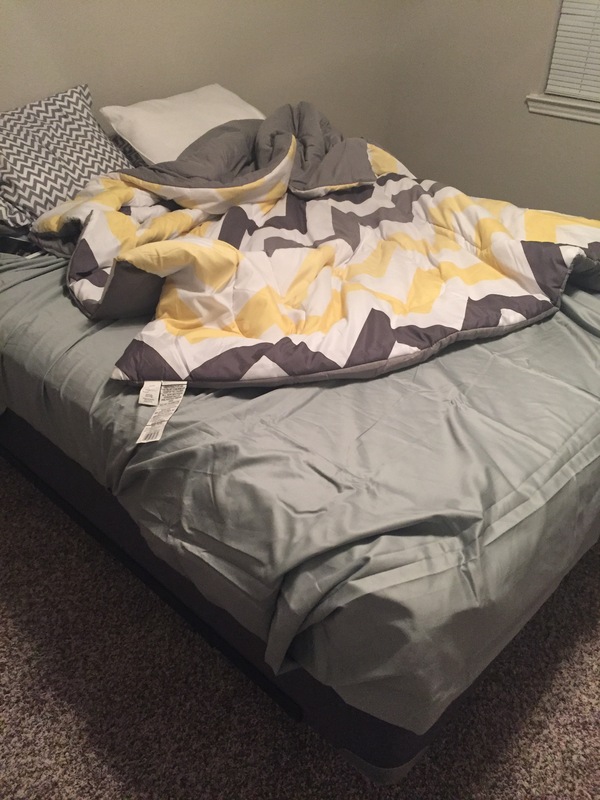 Until late in the evening, when my belly felt guilty for what happened and decided to punish me with echoes of weird alien noises, groans, sighs, and other related things. This lasted into this morning, when I became convinced that maybe something was now living inside of me? It’s better now. Much better. Maybe we’re OK. Maybe we’re out of the woods. Maybe nothing is indeed inhabiting my body. Maybe. But let’s go back to that moment, shall we? This wouldn’t be your Square Peg if we didn’t analyze every single iota of what happened yesterday. Yes, I wondered why Burrito Man was crying. Or was he crying? Tears of food-related joy? Was it sweat? But his car windows were closed, so the air conditioning was likely on. And he seemed thoroughly unconcerned. The world, for him, was that burrito. Honestly, yesterday was a testament to the oodles of junk I’ve been eating since I arrived in this state. I don’t doubt that it has everything to do with the hills and valleys of my fluctuating emotions. Hopefully things will get back to normal and the thought of resuming my four-day workouts won’t drive me right to comfort of my armchair. Le sigh. Did he see me staring? Did he even care? The drive-through Taco Bell guy has a story to tell for ages now: when I ordered my burrito, I asked if it was soft. “Of course it is,” he replied, chuckling. “It’s a burrito.” I informed him that it had been a long day. Living in TX now affords me the change to venture and try Mexican food, no? I’ll try it. As long as there are sweet fried plantains and beans involved. If you’re Ghanaian or West African, you feel me on this. The end. The moral of the story: the eyes may want something, but the belly will only be temporarily appeased until it turns against you. Make wise decisions. Have you ever eaten something that turned your digestive system into a vengeful alien? In other words, tell me all about your suffering in the comments. Please and thank you. Misery loves company. how dare you guess my actual age? June 17, 2016 Categories Gratitude, Hilarity, Life, Me, Woman2 Comments on how dare you guess my actual age? Thanks to the African juices/genetics (thanks, Daddy and Ma), I have somewhat youthful features. When I was a teenager, I looked younger. When I was in my mid-20s, a woman at a hair salon once asked me if I was excited about Homecoming. Her shock when I explained that I was 26 years old–and not 15, like the girls getting their hair done–was memorable. Even in this later-third decade of life, when I meet new people, I frequently get a prolonged, quizzical stare before the onlooker leans forward and asks, “how old are you?” At a dance party last year, my dance partner asked me if I’d ever heard the song playing on the loudspeaker. It was “Motownphilly” by Boyz 2 Men. I replied that of course I knew it and that I grew up listening to it. I couldn’t help but laugh at his reaction. All that said, a lady gets used to questions like this, at the raised eyebrows of surprise, at the declarations that they would have never guessed my age. By the way, any woman who claims to find these questions/comments to be a nuisance and complains about them is trying to pull a bit of wool over your eyes, dear reader. Sure, there’s a difference between questioning age and questioning maturity (an entirely different animal), but who doesn’t like a bit of surprise when you explain that you’re older than you look? Come on. Anywho, keeping all of that in mind, imagine my reaction when someone guessed my actual age. About a year ago, while in Alabama to visit the bestie, a bunch of us were chatting. Lady: Do you mind if I ask how old you are? Me (with muted pride and a mischievous, tiny smile in expectation of the impending guess): How old do you think I am? Me (muted pride and mischievous, tiny smile vanish): You’re right. The sheer audacity of that woman, I later raged to my bestie, who was laughing so hard and hysterically that tears brimmed in her eyes. How dare she accurately guess how old I am? I was well aware of how foolish I sounded, y’all. But that didn’t stop me from waving my arms in the air and pontificating on how she was certainly in the minority, that several people believed me to be younger than I looked. Later, after I finally came out of my age-related fugue, I joined my best friend in loud, raucous laughter. “Welcome to the real world,” she pronounced. “Indeed,” I replied. Happy Friday, everyone. Because I adore you and because my 15 year-old self danced to this song in my bedroom, here you go. April 25, 2016 April 25, 2016 Categories Hilarity, Life, Me2 Comments on The One and Done. Other than drinking copious amounts of champagne while watching the Academy Awards when I was 16 years old (how nerds “turn up”; we all make mistakes), This Square Peg can’t make it beyond one drink. I was reminded of this during the weekend, when a friend offered me wine at a cookout. After a few, tiny sips, I was giggling like a happy fool. And that’s typically what happens: I take a few sips and I start laughing. And speaking at a decibel only cute puppies can hear. And complaining about the heat. Case in point: I went to a swanky restaurant in the city with my uncle and brother and had half of a cocktail. By the end of that partial cocktail, I was fanning myself, complaining of an invisible heat, cackling, my voice raised as I asked whether George Clooney, who was known to frequent the establishment, was in the room. The ride home found me sprawled in the backseat of the car, asleep and muttering under my breath. You can imagine how much fun my family had with me. Fizzy, bubbly things like champagne and fruity drinks are wonderful. Harder drinks are out of the question. Overall, though, add my inability to take more than one drink to the rest of the things I generally can’t do: tumble, eat spicy foods, and engage in anything having to do with roller coasters and/or lifting these feet off the ground when they’re not in an airplane. Ah, well. C’est la vie.